What is the Arborfield SDL? You Are Here: Home » Comment » Who has Your Vote? It’s that time of year again, borough election day is Thursday 3rd May. As usual only a third of Wokingham Borough Council is being re-elected on a four year term so in particular for one seat wards like Arborfield, this is an important vote for how you want to be represented until 2022. Key issues that will be addressed over that period are that by 2022 a lot more of the Arborfield Garrison SDL will be built out, but more importantly the council will have to determine where the tens of thousands of more houses the borough is planning to build after the current strategic development locations are completed will go – Grazeley, Barkham Square, Hall Farm? This election in Arborfield is also a bit different. For the last few elections, although we’ve had the odd candidate from UKIP or Labour, the election in Arborfield has always been a straight fight between the Conservatives and the Liberal Democrats. Steve Bacon, a long time Arborfield resident had been our Liberal Democrat councillor, but in 1997 narrowly lost to Gary Cowan, another Arborfield resident standing for the Conservatives in part over a Liberal Democrat plan to create a strategic development location at Grazeley. The Conservatives were elected across the borough on a promise to minimise house building, and most significantly they canned the Grazeley plan, John Redwood our MP even planted a tree in Grazeley promising the area would be preserved. Roll forward to November 2016, and Gary was the first of a number of long standing councillors to quit the Conservatives, after revealing that the Conservative group had in secret been planning a significant new development of 15,000 houses at Grazeley – almost ten times the numbers proposed by the Liberal Democrats twenty years earlier. As highlighted in the press coverage at the time, after disagreeing over Grazeley, Gary was initially just deselected as Conservative candidate for Arborfield, and would have been allowed to serve the remainder of his term as a Conservative councillor on the understanding he wouldn’t run this time, he instead chose to resign, and has been an independent ever since. It’s fair to say that Gary has always been pretty independent even before he resigned, most notably was a heated council meeting which many local residents attended and will remember when the Arborfield Garrison SDL was finally adopted. At that point Gary was a member of the Executive, and the meeting was actually stopped for a period when Gary said that he couldn’t vote for the plan because the concerns of Arborfield residents had not been properly taken on board. After stopping the meeting the entire executive disappeared into a side room, and came back with Gary looking ashen faced. When the meeting was restarted Gary still didn’t vote in favour, and lost his executive role and was sent to the back benches shortly afterwards. 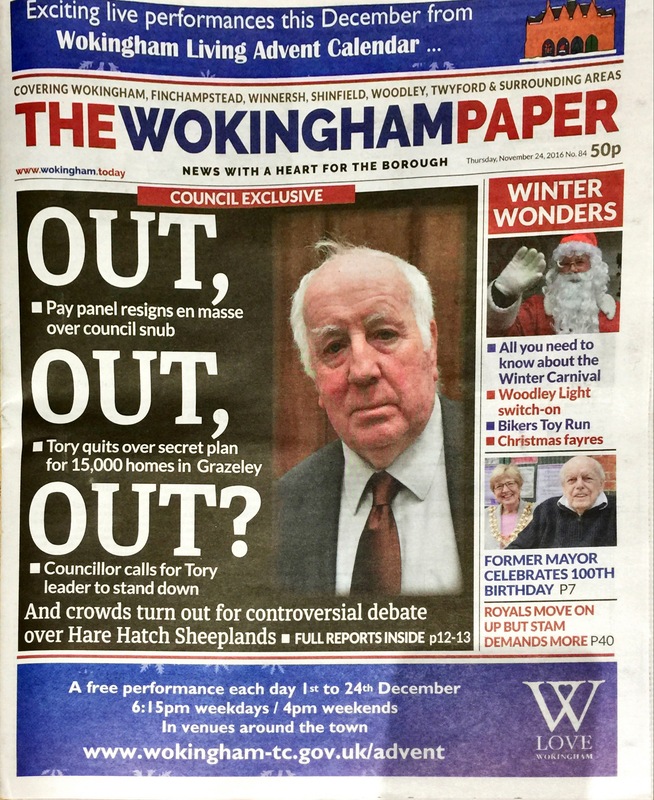 He also backed local residents over the routing of the Arborfield Relief Road when Wokingham Borough wanted a cheaper route that ran directly behind Chamberlain Gardens and sliced through Lockey Farm, and continues to fight for the medical centre on Arborfield Green that was dropped by the local clinical commissioning group. This highlights one of the difficulties of being a local councillor backed by a political party, you serve two masters. On the one hand you are answerable to your electorate, to the people of your ward, on the other you are answerable to your party. The difficulty comes when your political party is asking you to do something that is not in the best interests of your residents. Currently one of the main ways that Wokingham Borough Council is financing new infrastructure like roads and schools is by building houses, each new house built brings in extra money. Agreeing to take a development like Grazeley brings in even more money, as by taking those houses the council gets extra money from the government. 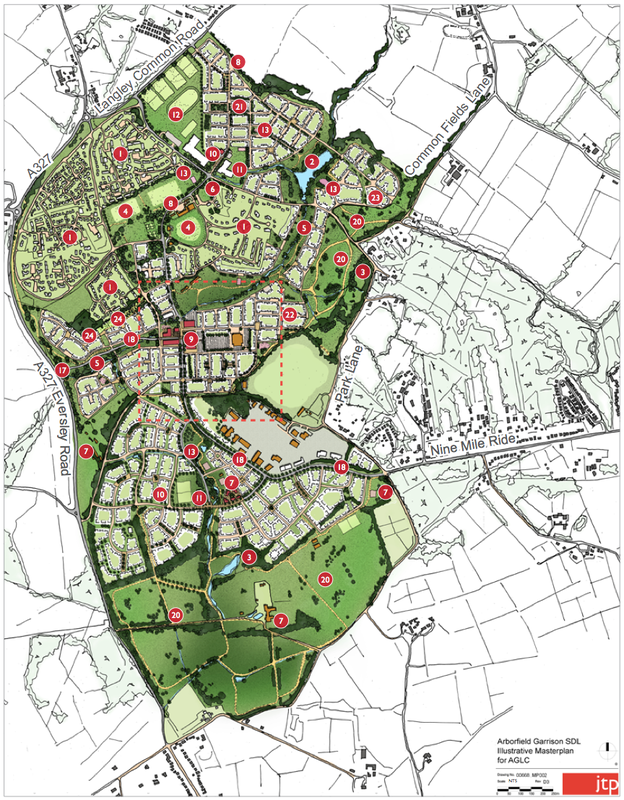 Whilst most local residents understand that there needs to be some building, equally most of the existing residents moved to places like Arborfield because they are villages, and want proportionate development that retains the character of the communities. 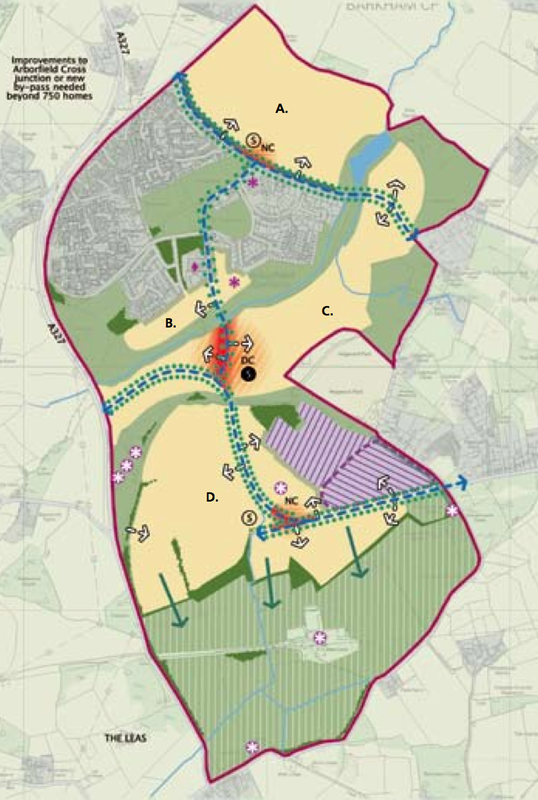 With Arborfield we currently have the largest strategic development location in the borough, and it’s no secret that the new infrastructure being built here can easily accommodate many more houses close by. 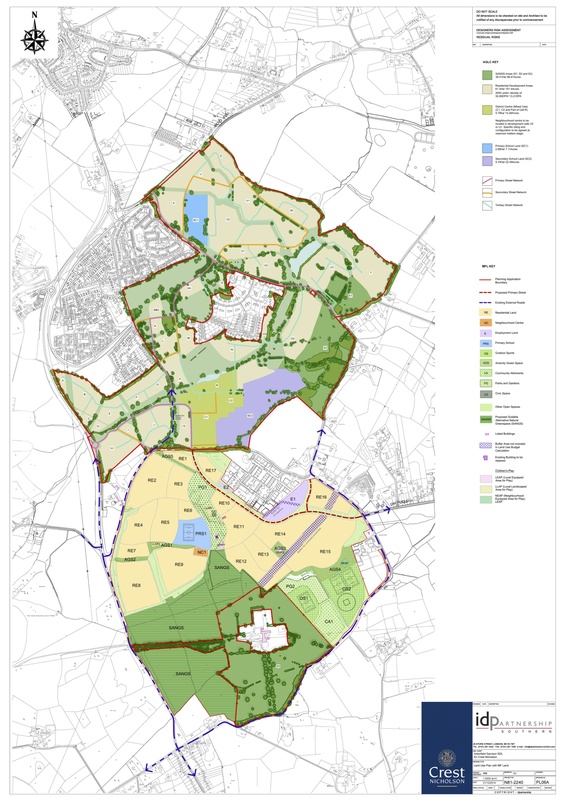 If you take a look at the map of areas under consideration for new housing in our part of the borough, Grazeley is obvious, but less talked about is the significant areas of land around Arborfield. At the most recent Community Forum Crest were already including Barkham Square as an area they’d secured for development, and the council is already in early planning consultation for what infrastructure will be needed. Barkham Square was highlighted in the press last autumn, and again here. There are also significant areas, some of which are already getting planning applications put forward around the south side of Arborfield Cross either side of School Road and around to the A327 and beyond that would fill the gap between Arborfield Cross and Arborfield Green. 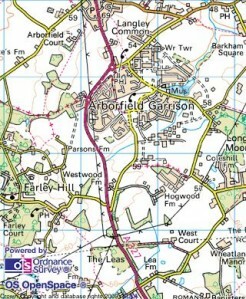 However the biggest area by far is around Arborfield itself which is Hall Farm, the land owned by the University. This site extends as far as Sindlesham and the M4 in the north and the A327 in the south. It’s certainly not on the table in the same way as Barkham Square is, but the University has made significant money over the last few years selling land around Shinfield for housing for the South of M4 SDL, and Hall Farm would represent a significant amount of additional money should it be developed. So that brings us to the election. This time we have three candidates, Gary Cowan is standing as an independent, the Conservatives have nominated David Edmonds, and Chris Everett is standing for the Labour Party. There is no Liberal Democrat candidate this time, with the leader of Wokingham Liberal Democrats backing Gary instead. Of the three Gary is the only one who actually lives in Arborfield. David Edmonds is a long time resident of Riseley, and Chris Everett lives in Wokingham. A Labour party candidate in Arborfield is comparatively rare. Chris Everett has been an active campaigner for Labour across the borough and has run for the council before, for example he ran as the Labour party candidate in the Emmbrook by-election last year getting 79 votes. As yet we really haven’t heard anything from Chris around here and it certainly seems likely he is a paper candidate. It’s safe to say that the Conservatives desperately want to win Arborfield back. Given what happened with Gary, they’re obviously wanting a party loyalist – David is treasurer of Wokingham Conservatives. He also runs his own accountancy firm, which is coincidentally based in Grazeley, skills that he highlighted in early campaign material would be beneficial in helping the council use their limited resources wisely. Unlike the Labour candidate he has been trying to be seen to engage with local concerns. So he is apparently against the gravel extraction on Farley Farms – although he didn’t object at the time. He’s also against the new housing developments on School Road, although it wasn’t until it was pointed out that he hadn’t objected to those either, that on the last day of objections he actually put in two objections to the developments, and his wife duly highlighted the fact on social media. He is also apparently fighting for a new medical centre in Arborfield, although once again he only has taken an interest in the run up to the election. These of course are clearly not much more than the usual publicity stunts for the period of higher scrutiny in the run up to the election. Before either David or Chris were selected you won’t have seen them involved in village life, or attending the Arborfield Community Forums. You won’t have seen them on the local social media, nor seen letters from them in the local paper, or writing in the Arborfield News. Indeed even after having been selected neither of them bothered to show up to the annual Arborfield Parish Meeting a few weeks back to take the opportunity to meet local electors. For local Conservatives, Arborfield has always been considered a safe seat, a shoe in to get a useful pair of hands like David Edmonds and his financial expertise onto the council. The complication for them is that independent to the last, Gary hasn’t done what the Conservatives wanted and stood aside as they told him to. So that brings us on to Gary. If you look at the other Conservative councillors who left the party at around the same time as he did in 2016, one switched to the Liberal Democrats, and the other resigned altogether, only Gary continued to serve out the remainder of his term as an independent. 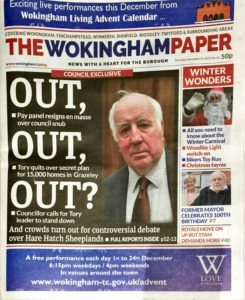 Independents have historically had difficulty getting elected in Wokingham, but we were glad to find him putting his hat into the ring again this time to continue to serve Arborfield. Gary we’re sure will highlight his long record of successes over the years he has served Arborfield. Prior to resigning the party whip Gary would be limited by the party in what he could say, but having resigned he has been active in putting forward the views of Arborfield residents in council and attending relevant meetings such as the many community forums and planning meetings. Other councillors refer to him as “Mr Arborfield”, and if the primary role of a local councillor is to consistently represent his constituents, he has done that admirably. 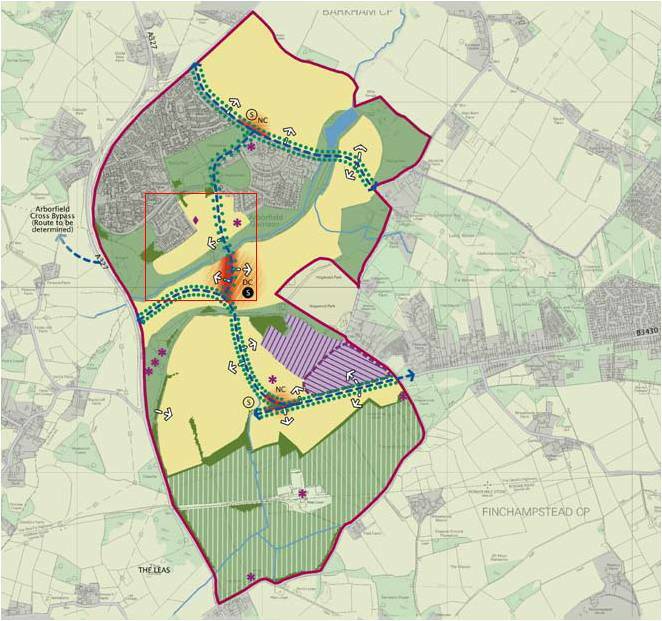 Certainly whatever May 3rd brings, we will always be grateful for the support he has shown our group over the years in order to ensure that the concerns of Arborfield residents were highlighted as we accommodated the biggest strategic development location in the borough. We have no idea what went on in that side room when the SDL was adopted, but Gary showed on that night and since then that he’d put Arborfield over party orders, and ultimately the party paid him back by trying to force him out. We also can’t fail to acknowledge his integrity in going against party orders over the resurrection of Grazeley because he’d stood on a ticket of no housing at Grazeley when he was first elected. So there you have it, on May 3rd will you pick candidate number one, Gary Cowan, described by many of his fellow councillors as “Mr Arborfield”. Candidate number two David Edmonds, the social media savvy accountant from Riseley, who thinks Arborfield is great, but just doesn’t want to live here, and just happens to be Wokingham Conservatives treasurer. Or will you pick candidate number three, Chris Everett, the Labour Party activist from Wokingham who nobody has seen and who is hoping that Arborfield will give him more than 79 votes. The Arborfield Garrison Resident's Action Group (AG-RAG) represents the civilian residents who mostly live in the southern part of Arborfield. Although this area is adjacent to the Arborfield Garrison itself, the AG-RAG does not represent the views or interests of the MoD or the Military Commander of the Arborfield Garrison.